An ABC News editorial producer earned the online equivalent of a hard slap to the face Friday, after she used Twitter to approach two people for interviews who were painfully close to the morning massacre of a Connecticut elementary school. 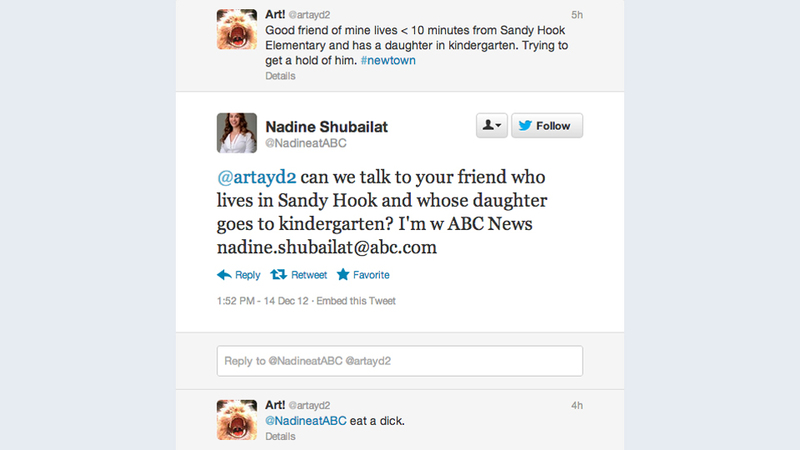 Nadine Shubailat tweeted interview requests to a man who said his “good friend” had a child in kindergarten at Sandy Hook Elementary School in Newtown, Conn., and to a woman whose cousin was a first-grade teacher killed in the Friday morning gun rampage. In the second case, Shubailat was not the only reporter to go after a victim’s relative. A second ABC producer, a New York Times reporter and a Los Angeles-based producer of a YouTube-only news program also approached the grieving woman for interviews just hours after her 22-year-old relative was shot to death. Shubailat’s LinkedIn profile boasts that she books interview subjects for Diane Sawyer, George Stephanopoulos, Barbara Walters, Robin Roberts, Jake Tapper, Bob Woodruff and other ABC journalists. It also says she was previously a senior producer for “Larry King Live,” and the press secretary to Queen Noor of Jordan. A screen-capture of the exchange quickly made the rounds on the social media website Reddit before it was reported by Gawker. At the time, reports were swirling that the killer’s first name was Ryan because Adam Lanza, who was found dead at the scene and is presumed to be the shooter, carried his brother Ryan’s identification to the school. “Kayla I am so sorry for your loss,” Shubailat tweeted in response. “May I speak to you please? I’m with ABC News.” Shubailat also provided her email address. Shubailat later deleted both of her tweets, but she had company. About 75 minutes after Pjatak tweeted a link to a photograph of her unnamed, deceased cousin, New York Times Metro reporter Sam Dolnick responded. An online profile of Gomez describes him as an online marketing manager for the Aerobics and Fitness Association of America and a “course advisor” for social media classes offered by Mediabistro.com. Shubailat did not respond to an email request for comment. Reached late Friday via phone, she declined to comment and hung up on The Daily Caller.